When my belly first started rounding out, I had a hard time making the bed. I remember one morning trying to pull the heavy duvet cover up and over the mattress; I got so frustrated that I just gave up and climbed back into bed. As I lay there, I thought of the baby that would be co-sleeping with us in a few months. I imagined the ease of having my baby right next to me for nursing, traveling and of course attachment and bonding. When Noele was born, we welcomed her into our bed and she nursed like a champ. Although I didn’t mind, she never slept for more than an hour or two before wanting to nurse again. I never expected her to sleep through the night at three months nor did I long to share my duties with my husband. I loved living in our attached family bed bliss. Noele sleeping in her crib at two months. One afternoon while I was wearing Nolie in my Moby Wrap, she became fussy and wiggly. So at four weeks of age, I put her in her crib for the first time. When I finished working with the laundry, I went to get her and lo and behold, she was sleeping! This was the first time she had slept anywhere but on my chest, and she ended up sleeping for three hours. I was in complete shock. That night when she was restless and fussy and showed no interest in nursing, I had an ‘aha’ moment and put her in her crib. She slept for more than five hours. After that I tried to no avail to get her back into our bed. She might start off there, but after a period of rolling and kicking she would end up back in the crib, sleeping for four or five hours. I knew my nights of co-sleeping had ended far sooner than I wanted. I started to worry about what my friends would think of me. They are all attachment parents and I felt like I was betraying a cardinal rule by allowing my baby to sleep alone. Worse still, I was starting to like it! At first, I was afraid my friends would think I had abandoned both my daughter and my attachment parenting ways. But as the nights went on I realized that I was still bonding with my daughter, because I was responding to her at all hours of the day and night. She didn’t have to sleep with us in the same room for us to have an attached relationship, and I didn’t have to feel guilty because she wasn’t in our bed. Now, over a year old and still waking at least twice (more often three or four) a night to nurse, I have no doubts about our relationship or dedication to natural parenting. Being willing to cross the hall four times a night to nurse isn’t always easy, but I cling to the knowledge that this time is short and I know I will miss her wanting me. Even though my idyllic dream of co-sleeping didn’t come true, I am still an attachment parent, even from across the hall. Autumn is a young SAHM living her dream by parenting the quirkiest, silliest 14-month-old you could ever ask for. Her family enjoys hiking, exploring and trying not to eat too many rocks in the lovely Pacific Northwest. At Playing House – Full Time, she blogs about the honest struggles of parenting, being a wife and trying hard to keep it all within budget. I love love love this post. I, too, do not co-sleep, and sometimes feel judged by this network. It never worked for us, and my baby boy sleeps 8 to 8 in his crib with one feeding (sometimes 2!) It works for me — snuggling with the husband, smothering all the pillows around me, and I have to get up to pee when my son wakes up anyhow! Thanks so much for writing this and to the NPN for posting it! I too love this post! Attachment parenting is about responding to your child’s needs and fostering a good attachment – not following a set of rules whether they work or not. My family has slept in several different configurations over the past almost 5(!) years – always going with whatever works that night. It’s just about going with the flow and helping your child to develop a good attitude about life and his or her bodily processes. Good for you for following your baby’s cues! I love this article. This is my first baby, but we do not co sleep and never set out to co sleep….but I’m very much an AP. I don’t mind getting up and going across the hall to nurse my little girl. I nurse her on demand all day and night and wear her constantly as I bring her to work. We couldn’t be closer, even though yes, she does sleep alone in her crib and sleeps well at that. She’s 3 months old and we share an ultimate deep bond together. I do co-sleep, but I still love this post. Attachment Parenting is about responding to your child’s needs, not forcing things on them because it’s what you wanted or expected. Attachment parenting is, IMHO, meeting the needs of your child even if it comes at some personal sacrifice. I’d say that your meeting your baby’s need by hauling your sorry carcass across the hall twice or more a night is a heck of a lot more sacrificial than my rolling over in bed 🙂 Kudos to you for meeting your child’s individual need for a separate sleep space. One way you might be able to have the best of both worlds is to move the crib into your room, if you wanted to try that? Thanks for sharing this! I think attachment parenting is being in tune to what’s best for your baby and your family. There are no set rules to follow other than this to me! Lorien totally has it right. Autumn, every time I see you looking tired (but mysteriously fabulous — ?? ), I feel sooo guilty for the luxury of being able to roll over and nurse a baby that loves to sleep in. I mean, of course, I do it because I’m such a devoted attached parent, not because I’m lazy. Ahem. Wonderful post! Well said! Sometimes I wonder if my online AP friends realize that I don’t do cloth diapers and what they would think… but it just wasn’t for me (and, probably more specifically, my husband) this time around. Thanks for reminding us to do what is right for our family, regardless of what others think. We only, each of us, knows our bond with our children. Though… I wonder, have you ever considered moving the crib closer, just for convenience? We chose to co-sleep, or what we termed as much. It wasn’t until she was about a year old that I learned there were “definitions” of the term. Hour one through about week one, she slept between us in a Snuggle Nest (http://pregnancy.about.com/od/babyproducts/gr/snuglenest.htm). Week two – four, same but on my side between me and the wall. When she outgrew that, we moved her to my side of the bed in the bassinet part of a pack n play. Then, to the base of it. 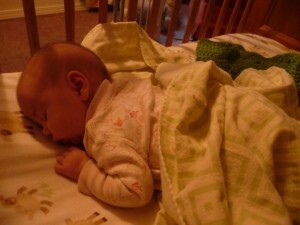 Then, when she outgrew that, about month 4, we put the crib on my side of the bed. By 12 months, the crib was in use, with one side missing, opened to our bed. We secured the crib between the bed and wall so no possibility of falling/strangling. 16 months, we exchanged the crib for a toddler bed, next to my side of the bed. Same scenario. About this same time, we put a toddler bed in her own room, where she took naps and would often go to sleep at night. I would then bring her into her bed in our room when I was ready to sleep. 24 months, toddler bed for twin bed on box, no frame, which brought the levels to 6″ or so below my bed, still snug between my bed and wall. She never liked our movements while sleeping, but nursed when she pleased, so having her within range for her to get to me and latch on was paramount. I never had to get up/out of bed. Now, I put her to bed a few hours before I go to bed, and get her up to use the bathroom just before I intend to sleep. We all sleep through the night. Neither my husband, my kiddo, nor I have ever been sleep deprived, except at 17 months when it took me a couple weeks to figure out she needed food at 4am. At this time nursing wasn’t enough and the poor kid couldn’t get back to sleep because she was hungry – it took me too long to figure it out, but once I did, and fed her, she would go right back to sleep. This phase lasted about 6 weeks. If we have another child, I assume we will do something similar, but honestly, we took our cues from our daughter. We adapted as she grew. And in our case, our room is large enough that if I’d had another infant while she was still in our room, I would have just shifted her bed to accommodate both. Because we nurse the moment she even barely whimpered, we never had a “crying” infant to deal with at night (or otherwise). what you are doing every night is far more difficult than what i do every night co-sleeping, in my opinion. way to go you for sticking to what you believe and doing what works for your family in spite of your fears of what others may think. that is the sign of a great mama! much love to you! Autumn, beautifully written essay! Thank you for voicing how you have come to define attachment parenting for yourselves. As a doula I work with so many families looking for advice, information, answers and insight into parenting. From experience I can honestly say that there are myriad “right ways” to bond with your child. 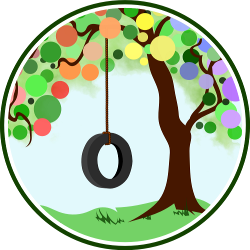 Sometimes only one way works for a family, other times an openness to many different parenting actions (as opposed to parenting philosophies since I write this in the AP vein) seems to be helpful in finding a course right for the time at hand. Thank you for writing about this. I’ll be passing this link on! Thanks so much for the encouragement ladies! I love hearing what is working for you guys and how you are meeting your child(ren)s needs and being a nighttime parent too. I do wish that sleeping in the same bed had worked, but she made it clear that she slept better in her crib. And I decided that I needed to forgo what I had wanted in favor of her quality sleep. We tried the pac n’ play in our room for awhile and it never worked as well. I wonder now though if she would be a better sleeper if she coslept (she is up. . . a lot at night now at 16months). We have tried bringing her back to bed but, save for a few early morning nursing times, she only sees our bed as a place for play time. Thanks again for reading, commenting and being such an awesome and supportive community! Co-sleeping isn’t for everyone and it isn’t for all times in a child’s or parent’s relationship. We have three boys and they all co-slept to some degree, but I found their different personalities really impacted how long/often they wanted to share our bed. My oldest was restless in our bed as he became older and ended up moving to his own crib before his first birthday. My second slept in a crib in our room almost from day one, but started coming to our bed as he grew older (and still does on occasion at age 4!) My youngest was more like my oldest.